Sanayi313 "Trasimeno" embroidered fabric mule. Designer Serena Uziyel honed her technique at Parsons School of Design before cofounding this artisan-made collection with her brothers, Enis and Amir Karavil. 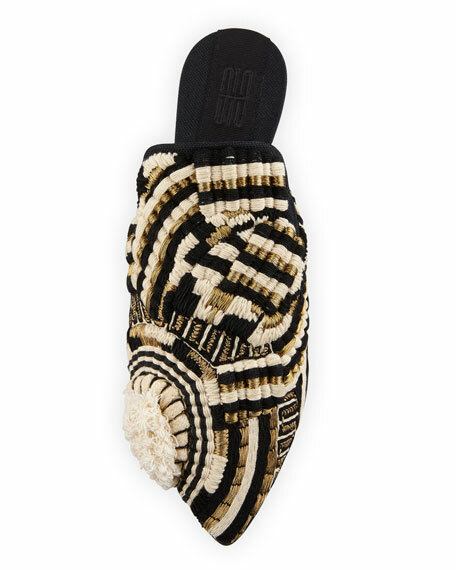 Sanayi313 celebrates traditional craftsmanshipsome shoes take 36 hours of intricate weaving to complete. 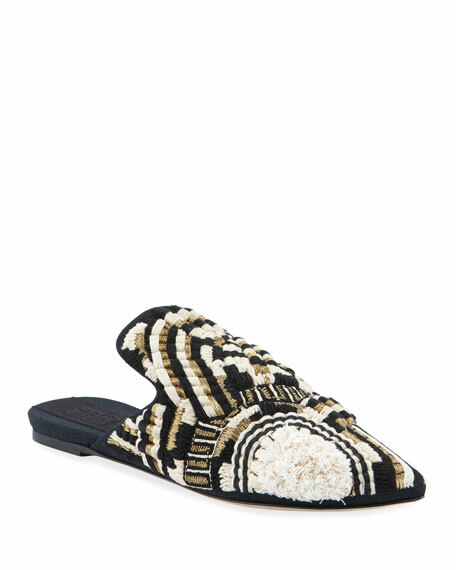 Alepel hand-painted soft leather mules with zebra-print detail. 0.5" stacked heel. Round toe. Notched vamp. Slide style. Cushioned footbed. Smooth outsole. Made in Brazil. Mercedes Castillo kid suede mules with contrast stitching. Flat heel. Pointed toe. Knot detail at upper. Slide style. Leather lining. Smooth outsole. "Kura" is made in Brazil. 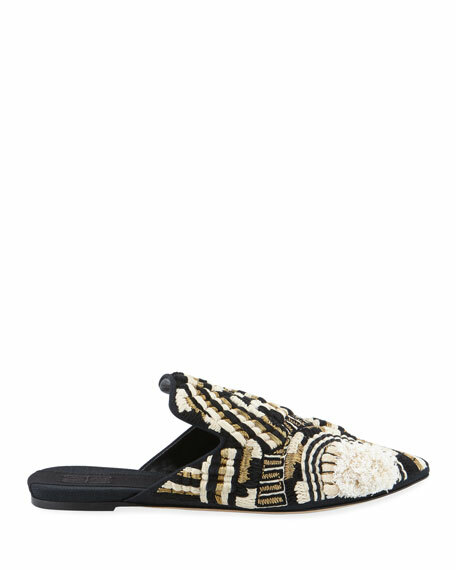 Proenza Schouler leather mules. 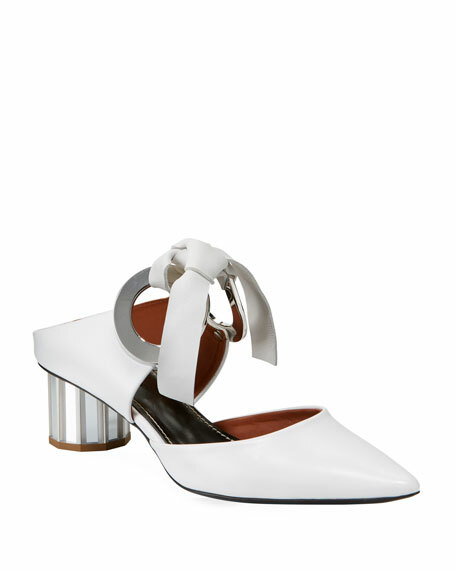 1.5" mirrored column heel. Pointed toe. Fixed self-tie center secured by rings. Slide style. Leather lining. "Pillar" is imported. 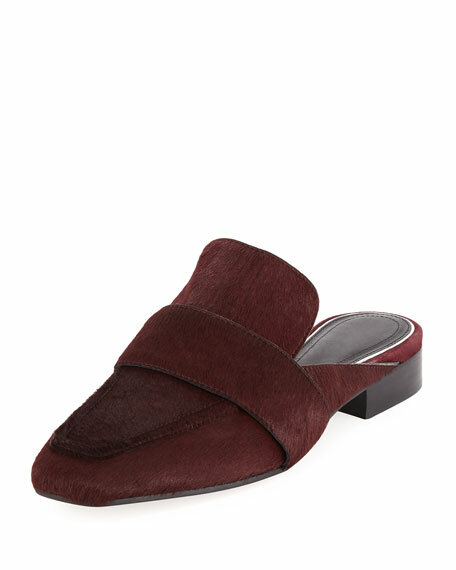 Rag & Bone dyed calf fur (Turkey) mules. Stacked block heel. Round toe. Keeper strap at notched vamp. Slide style. Leather lining and sole. "Carson" is imported.